Author: Steve Tobias at the University of Leeds. The regular solar activity cycle is one of the most striking examples of systematic behaviour emerging from a turbulent and disordered system. The cyclic behaviour is most easily seen in the behaviour of solar active regions; at the start of a cycle sunspot pairs are observed at mid-latitudes in both hemispheres, then as the cycle progresses the wave of activity moves towards the equator until the cycle dies out with active regions being found near the equator. As the old cycle dies a new one starts with sunspots at mid-latitudes of the opposite polarity. This activity is shown most clearly in the “Solar Butterfly diagram” of Figure 1. The origin of this eleven-year cycle is believed to lie in a hydromagnetic dynamo acting deep within the Sun [1,2]. The wings of the butterfly can be interpreted as waves of magnetic activity propagating from mid-latitudes to the equator. In parallel with the sunspot activity the Sun’s global meridional field also cycles; reversing out of phase with the sunspots at solar maximum. None of the proposed scenarios for dynamo action in the Sun is entirely satisfactory – each has strengths and weaknesses. The (essentially) non-linear driving of a dynamo via the action of Lorentz-force driven flows can be shown to work well under conditions of smooth, laminar flows. However, the presence of turbulence may lead to the breakdown of systematic behaviour. The conveyor belt (or flux-transport) models rely on the presence of a meridional flow of exactly the right form to transport the flux from the surface to the base of the convection zone; furthermore these models give the wrong dependence of magnetic cycle period on rotation rate when applied to other solar-type stars. The turbulent dynamo, however, is in some sense generic, relying only on rotation and enough energy to drive the dynamo flows to generate systematic magnetic behaviour. But it has remained frustratingly difficult to produce systematic behaviour from turbulent dynamo models for highly conducting plasma, i.e. plasma at the high values of the magnetic Reynolds number, Rm relevant for the solar interior. The theory for the generation of systematic magnetic fields via turbulent dynamo action has a major problem that arises when solving the induction equation at high Rm. This is the so-called kinematic dynamo problem, where the magnetic field is solved for with a prescribed velocity field. 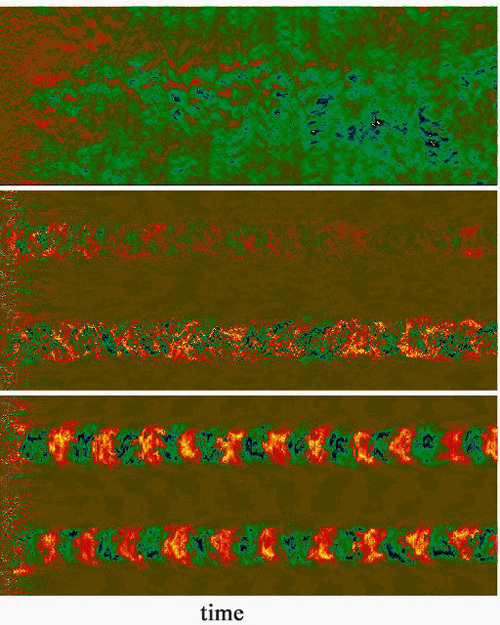 When the velocity field is turbulent with a characteristic length-scale and time-scale (usually chosen to be a turnover time), systematic magnetic fields can be thought of as those that evolve with characteristic length-scales greater than that of the turbulence and time-scales longer than this turnover time. In the 1950’s E.N. Parker  made a major breakthrough by separating the fields into large-scale and small-scale parts and deriving equations for the evolution of the averaged quantities by using transport coefficients to parameterise the interactions, an approach formalised as mean-field electrodynamics in the 60’s and 70’s by the Potsdam  and Cambridge groups . For this approach to have any utility at all it turns out that the solutions of the averaged equations must correspond to the averages of the solutions of the true induction equation. However at high Rm, it has been very difficult to find flows for which this is true. The resulting magnetic field is usually completely dominated by fluctuations at the small scales, contrary to observations. One potential way round this problem of dominant small-scale fluctation is to use a shear flow to boost the mean induction [5,6]. This is not an unreasonable proposal for the solar dynamo, as shear flows are found throughout the convection zone and particularly in the solar tachocline (the layer of strong shear at the base of the solar convection zone). However, we take a radically different approach . Instead of trying to boost the generation of large-scale magnetic field, we use the shear flow to suppress the generation of the small scales. Our velocity field consists of two parts; a large-scale shear flow and a “cascade of cellular flows” that mimics a turbulent flow. This flow is also selected to be a stunningly efficient small-scale dynamo in the absence of shear and the set-up is optimised so that extremely high magnetic Reynolds numbers are possible (Rm ~ 500,000 using the scale of the shear – for more details see ) Two versions of the cellular flow are considered, one which has a strong net helicity and therefore lacks reflectional symmetry and one for which a reflectional symmetry is maintained on average. Figure 2: Dynamo waves at high Rm – Space-time plots of the averaged toroidal magnetic field as a function of latitude and time (after Tobias & Cattaneo 2013). Top panel – no shear. Middle panel – shear and non-helical flow. Bottom panel – shear and helical flow. These results were obtained using high-resolution simulations on the STFC- supported UKMHD consortium cluster (DiRAC) at the University of Leeds. The essential result is contained in Figure 2, which shows space-time plots of the toroidal (shear-aligned) magnetic field averaged over the azimuthal direction. In the absence of shear (top panel) the field is incoherent in time and small-scale; not unexpected at high Rm. For the case of a non-helical flow and moderate shear flow (middle panel) the field is concentrated into two bands at the maxima of the shears, but shows little spatio-temporal coherence. However for the case of a helical flow and moderate shear, the magnetic field shows both spatial and temporal coherence and remarkably takes the form of dynamo waves propagating in a direction perpendicular to the shear and the direction of variation of the shear. Here the shear has acted to suppress the small-scale incoherent dynamo and the system has generated a systematic magnetic field. These Parker-type dynamo waves are emerging naturally from the unaveraged equations and propagating at high Rm. Systematic large-scale fields taking the form of propagating dynamo waves can be generated at high Rm via the interaction of shear and helical turbulence. At such high values of Rm a newly discovered mechanism for the shear is to suppress the growth of small-scale fields and allow the large-scale dynamo to be seen. Tobias, S. & Weiss, N. The solar dynamo and the tachocline. In Hughes, D. W., Rosner, R. & Weiss, N. O. (eds.) The Solar Tachocline, 319–350 (2007). Yousef, T. A. et al. Phys. Rev. Lett. 100, 184501 (2008). 0710.3359. Sridhar, S. & Singh, N. K., J. Fluid Mech. 664, 265–285 (2010). 0910.2141.